What a treat it was to be greeted at the Jackson, Mississippi airport by my friend Dot Ward. Dot and I not only served as State Regents together but we enjoyed being Vice Presidents General at the same time and were able to pick right up on our friendship as though many years had not passed since our last visit. It underscored my opinion that friendships are the fiber making our work meaningful and rewarding. Cindy McNamara was a model of style and grace as she brought all of the Mississippi Daughters together to celebrate their many accomplishments. Enjoy her account of our gathering. 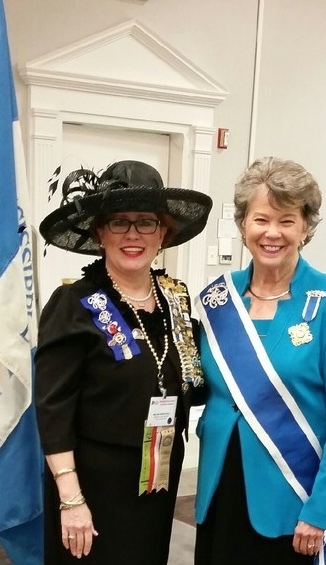 What a treat it was to see the sunshine and warm weather arrive just before our President General, Ann Dillon, landed in Jackson, MS for the MSSDAR’s Hats off to the DAR, Celebrating Education State Conference. Guests and daughters began arriving on February 14th and the State Society hosted a lovely Pre-Conference candlelit Valentine’s Dinner that evening in the Penthouse. Live entertainment was provided by Candie Lee, soloist, singing from the Great American Songbook making the evening all the more special. 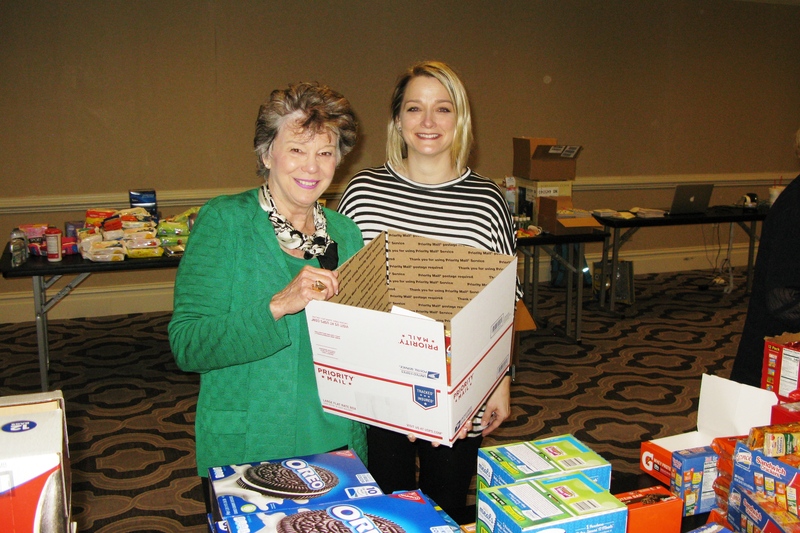 A conference highlight was to be a “Packing Party”, Lindsey Simon, Chair, beginning bright and early the next morning. Daughters were to pack boxes filled with our donated “goodies” to be sent to Mississippians being deployed overseas. Who was the first one there- you guessed it- the President General, packing the very first box. Our goal of 100 boxes was surpassed by 10:30 a.m. Getting more boxes, we were able to fill an amazing 189 boxes and raised enough funds to cover the $20/box shipping rate! Later that morning, our Conference guests, President General, Ann Turner Dillon; Peggy Troxell, Vice President General and DAR School Chair; State Regents Joyce B. Patton, Georgia; Cindi R. Carter, Iowa; Holly S. Blair, Massachusetts; and Cindy E. Henderson, Oklahoma were received at the historic 1842 Mississippi Governor’s Mansion and then given a private tour. It is the 2nd oldest continuously occupied Governor’s Mansion in the country. Hostesses were Dorothy B. Ward, Honorary State Regent, Past Vice President General and Montine Bond, State Chaplain. That afternoon, Sandy Pollack, NSDAR Director of Development, graciously agreed to present a fundraising forum for our members entitled “Beyond the Bake Sale”. It was a packed house and daughters left with great ideas to share back home and with a great new resource, Sandy! That evening, awards from Community Service to our DAR Medal of Honor winners were presented during our Opening Night Ceremony and Dinner hosted by the State Officer’s Club, Billie Jane Davis, President. It was such a delight to have our visiting State Regents bring greetings from their own State Societies. Then for the first time, all of the Representatives from our two DAR schools and four approved schools addressed the daughters on Opening Night. Friday morning, the President General, assisted by Sandy Pollack, hosted the Heritage Breakfast honoring Mississippi daughters who contribute to the National Society. This lovely venue offered Mrs. Dillon the opportunity to thank the MSSDAR donors for their part in helping to achieve the goals of President General’s Project during her administration to date and to discuss upcoming projects. Then it was on to our Hats off to the DAR Patriots Luncheon following the Morning Business Session. We were honored to have the President General speak to a sellout crowd of over 420 daughters and guests. Her insightful address was a revealing look at the state of our country and our National Society and her vision of the way forward together. It was incredibly well received by our daughters and our many guests. During the Afternoon Business Session, graduates of the New Horizon and New Member Courses received their Graduation Certificates from the President General and this State Regent. MSSDAR State Chair, Patty Turner, noted the significant increase from five (5) graduates last year to nineteen (19) this year. Also, receiving Certificates were Mississippi’s ten (10) newest members of the NSDAR 50 Year Club, Kay McKinnon, State Chair. Mississippi daughters are indeed moving forward and upward! 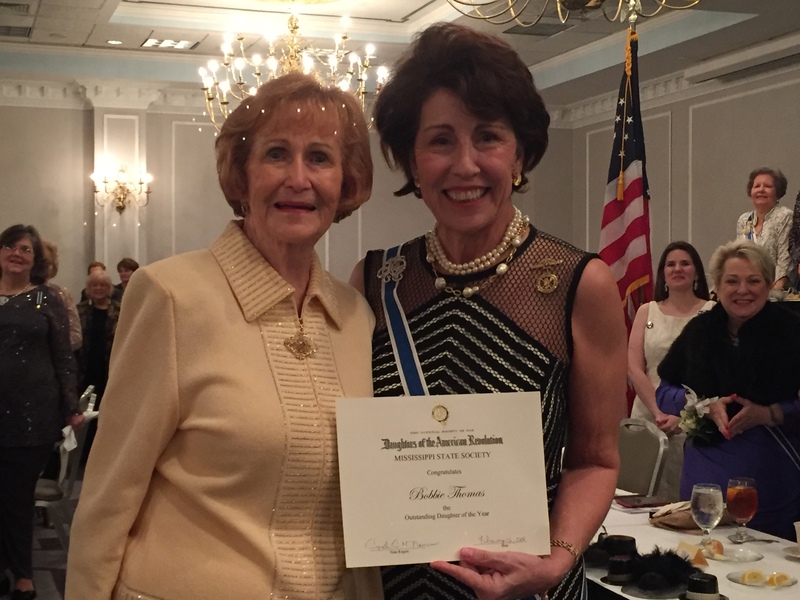 Chapter Regents Evening was a wonderful, fun filled night of laughter, games, and much deserved Chapter awards, all planned and emceed by Hellen Polk, First Vice Regent. A conference highlight was the State Regent’s presentation of the 2018 MSSDAR Outstanding Daughter of the Year, Bobbie Thomas, of the Friendship Oak Chapter. The evening concluded with the introduction of the Rosalie Rose Court and the Crowning of the 2018 Rosalie Rose, Mary Sue McGill Mosby. 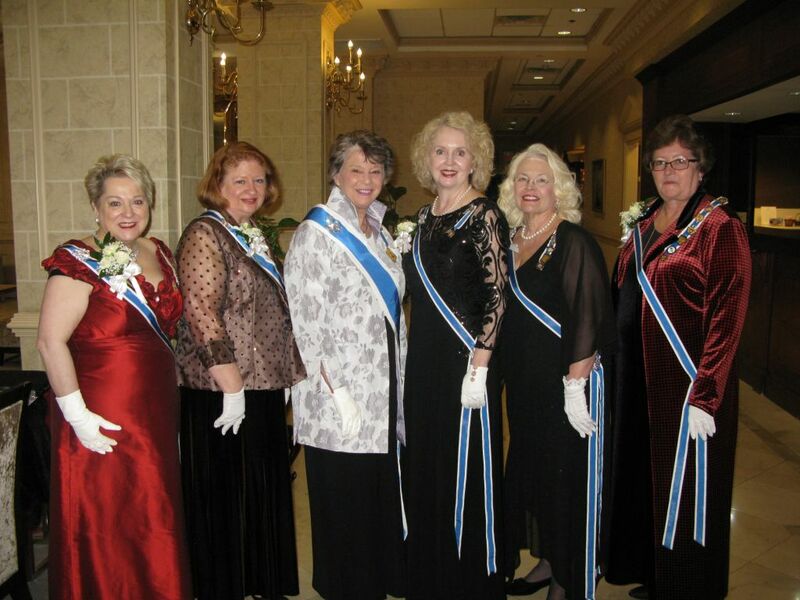 Our Rose and her Court raised almost $11,000 which was generously slated for the State Regent’s Project at Rosalie! The Conference ended with what has become a favorite venue- a very casual, no pins, no suits or sashes, Breakfast Forum. This year’s was an “All You Ever Wanted to Know about DAR Education” Breakfast Forum hosted by the Chapter Regent’s Club, Maxine Nolen, President, and led by JoAnne Collins, MSSDAR School Chair. Peggy Troxell, DAR School Chair, then took to the podium and spoke on all of the basics regarding the schools and this was followed by an in depth question and answer session. Chapter members really enjoyed being able to ask questions of the “DAR source” as well as the six school reps. It made for a truly informative forum! A huge thanks to all of our guests who traveled to be with us and to all of our daughters for participating in another great State Conference and most especially a sincere thank you to our President General, Ann Dillon. You’re the best! We wish you safe travels in the year ahead as you spread your enthusiasm and love for DAR, all while continuing to move us forward in service to America!